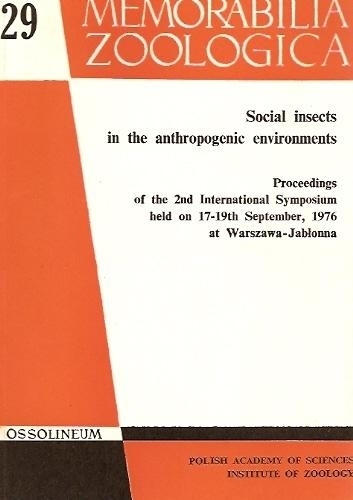 Les particularites ecologiques des termites nuisibles de l'URSS. The distribution and behaviour of Formica lugubris Zetterstedt in a forest in Northern England. Die hygienische Bedeutung der Pharaoameise. Die Verbreitung der Pharaoameise in Europa. Populations of Myrmica (Formicidae) living on different types of Calluna moorland - a semi-natural habitat of Southern England. Modification des populations d'Hymenopteres sociaux dans les milieux anthropogenes. 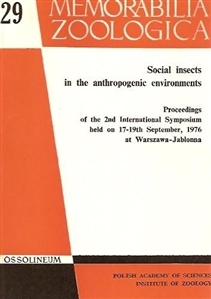 A comparison among ant communities in the anthropogenic environment. Experimentelle Erfahrungen an Laborzuchten der Pharaoameise (Monomorium pharaonis L., Myrmicinae). Adaptation of ants to industrial pollution. Influence de la pression urbaine sur la myrmecofaune. Les Fourmis (Formicidae) de la zone polluee des Establissements de l'azote de Puławy. Effect of winter timber felling on behaviour of foraging wood ants (Formica rufa group) in early spring. Influence de la pression urbaine sur les groupements de Vespidae. A succession of the ants (Formicidae) on afforested arable land and forest soils. Ecological effects of urbanization on the mound-building Formica L. species. Abundance and vertical distribution in soil of Microtermes (Isoptera, Termitidae) in savanna woodland and agricultural ecosystems at Mokwa, Nigeria.